The purpose of this project funded by the Nando Peretti Foundation is to make the Italian Fellowships in the Arts at the American Academy in Rome more widely known in Italy, to generate even more support and applications. Beginning in the early 1950s the Academy offered fellowships for Italians under the aegis of the Fulbright Commission, a program that was phased out by the Commission after 50 years of unqualified success. More than ninety Italians held this scholarship and the list of their names constitutes a Who's Who of distinguished professors, curators, museum directors, and other cultural luminaries. It would be impossible to overemphasize the importance of Italian Fulbright Fellows at the Academy, or the loss when the program ended. Even before the program ended, Academy Trustees, Friends and Fellows - including Italian Fulbright Fellows - came together to find a way to bring Italian fellows back into the Academy community. 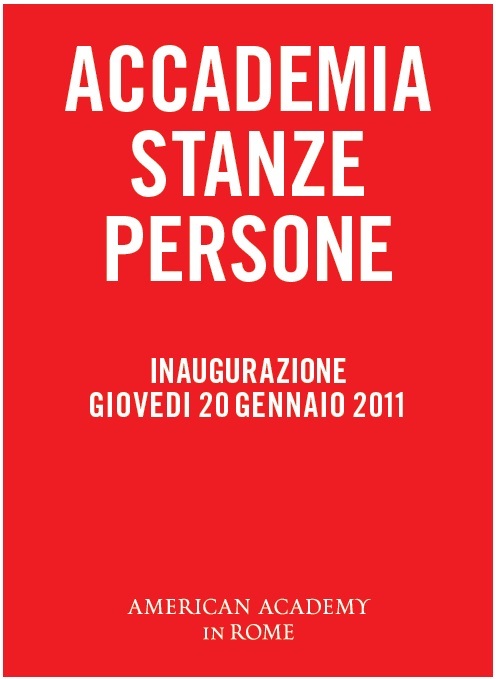 By fall, 2005, the Academy was able to inaugurate a new program of fellowships for Italian artists and scholars and an exchange with the Scuola Normale Superiore di Pisa, the latter arranged in collaboration with Salvatore Settis, who had been Italian Fulbright Fellow at the Academy in 1967-68. 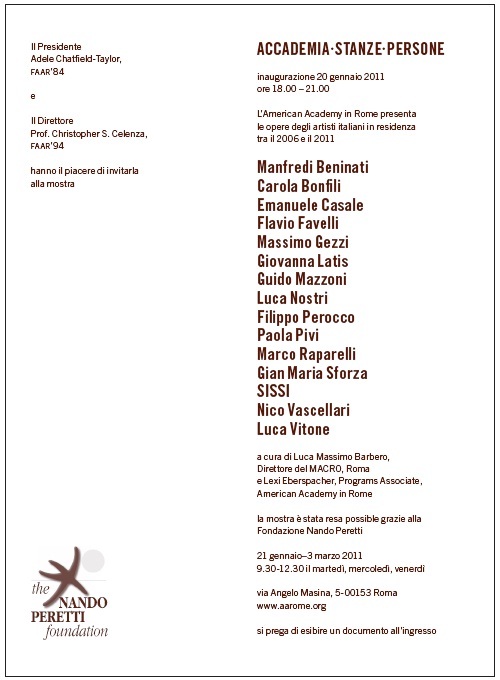 By 2006 sufficient funds had been secured to offer Academy fellowships to Italian artists as well. American Academy fellowships awarded to Italian artists and scholars are modeled on the Rome Prize fellowships. The winners receive a stipend, living accommodations (a private room with bath), a place to work (a study for the scholar or a studio for the artist), meals on weekdays and mid-day Saturday, 24-hour a day/7 days a week access to the Academy's library, and full participation in a full schedule of programs including concerts, conferences, exhibitions, lectures, readings and symposia as well as the opportunity to participate in travel programs. The most important benefit of the fellowship is the company of others at the American Academy in Rome, the mentorship of the more senior artists and scholars in the community during the year as Residents, as well as that of the senior staff: the Director, Andrew Heiskell Arts Director, Andrew W. Mellon Professor-in-Charge, and the Drue Heinz Librarian. The experience of Italian Academy Fellows through the years has been quite strong: no fewer than one dozen have been elected members of the Accademia dei Lincei. All reports from these former Italian fellows indicate that their time at the Academy remains among their fondest memories, for the intellectually stimulating environment, for the friendships, for the great amount of work accomplished, and often enough for the new perspectives that they gained on their work and lives. Walter Cupperi, a brilliant young art historian at the Scuola Normale di Pisa, said of his experience at the American Academy in 2003-4, "The friendly atmosphere of the Academy provided an ideal framework within which to improve my linguistic knowledge and my understanding of American mentalities and academic life. The other Italian fellow (Andrea Volpe, an architect from Florence) and I shared with great enthusiasm the challenge to communicate something in exchange, which we did by organizing site visits (both within Rome and elsewhere in Italy), Italian dinners, and videotape projections, besides engaging in countless spontaneous conversations." 3. To demonstrate the importance of these fellowships to Italian corporations and individuals so that they will participate each spring in the McKim Medal Gala, the proceeds of which support fellowships for Italian artists and scholars. a.	the AAR will invite all the Italian arts fellows from the previous five years to exhibit their work or make available their music in the January exhibit. b. The organization will invite these Fellows also to be present for the opening of the exhibit. c.	The AAR launched a press campaign in summer 2010 to make the Italian and American public aware of these Italian fellows at the American Academy in Rome, and their achievements. a. To implement the project is an "urgent" need because AAR needs to mark five years of the success of the Italian fellows so that they and the importance of this fellowship opportunity for emerging Italian artists and scholars will be much more widely known in Italy. b. The exhibition, opening in January 2011, is timed to secure widespread attention, and enhance AAR efforts to solicit participation in the McKim Medal Gala and support for the fellowships in the coming years. c.	The project makes widely known the support of Italian and international corporations, foundations and philanthropists for fellowships for Italian artists and scholars at the American Academy in Rome. d.	The American Acedemy in Rome will be pleased to honor Elsa Peretti in this project by calling the exhibition at the American Academy in Rome Italian Fellows Retrospective.